base deck has a unique combination of 36 cards, and can be used as is or with more than 100 further cards. Back Design Golden brown background with the Oracle-X logo, title, and subtitle. Companion Material Little white booklet is downloadable from the Oracle-X website. oracle or tarot) very much as a leap of faith, based on here say and a look at a small selection of the cards. But with the Oracle-X pretty well everything you could want, excepting the physical deck, is there for you to see on their very comprehensive website. The content includes how the deck came to be, pictures and meanings of the cards, how to read them, what makes up the illustrations and an abundant selection of spreads. Now I have to issue a warning here if you are a cardaholic this could be a place of mighty temptation. You have been warned…! There is no theme to the deck, it is customisable and expandable to suit your own taste. You start off with a 36 card deck which is made up of a unique combination of cards. This deck is ready to read with, and in my experience comes up with some very accurate information. But then Temptation steps in! There is a wonderful selection of cards (and more to come) that can be purchased as and when you choose them. None or as many as you fancy, so that you can personalise and customise your deck and make it truly yours. I hasten to add that your original 36 cards give you a deck that will serve you well to do readings with, but if you can resist purchasing some of the other cards you are better than me! The extras cover such themes as Astrology, Animals and Nature, Timing. This is an ongoing project, so other subjects will be available in the future. The cards are poker sized and made of good stock. They are easy to handle, even for those with smaller hands, and they are easy to shuffle without having them either stick together or slide off in an uncontrollable fall. Each card has a Keyword and a Picture. 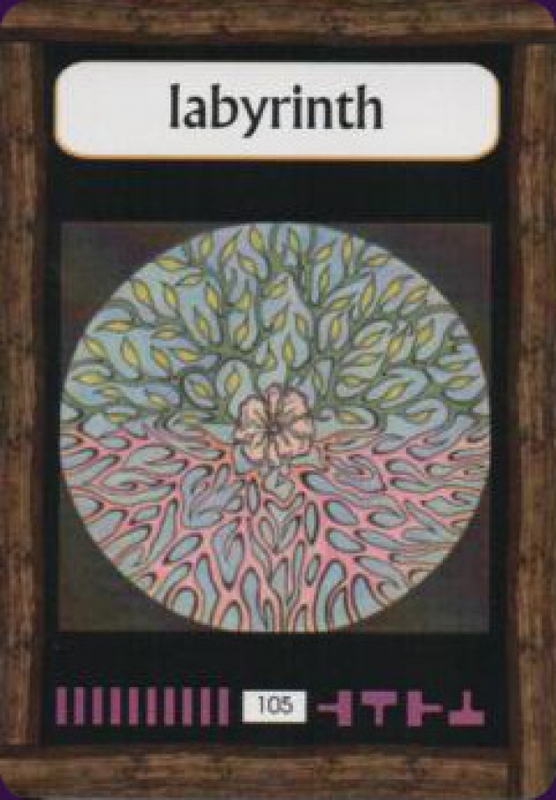 The Keyword is the primary meaning of the card, but in the simplistic list of meanings there are a further 7 secondary keywords, plus a space for you to add any of your own. This way of portraying the meanings gives you wee nibbles of how the card might interpret, and enough to encourage you to use your own intuition and imagination to explore the wider possibilities to personalise the reading. The pictures are easy to work with, they are beautifully composed, uncluttered but with detail that can help with gleaning the meanings. The colours are distinct but not overly bright, they are mellow with a lovely inviting beige theme. The background and reverse are brown/tan with black framing. You really need to see these to appreciate them. Also illustrated on the Front of the card is a grid and four runes. These are not conventional runes, but a ‘T’ in different positions, i.e. 1 x upright, 1 x upside down, 1 x over to the left and 1 x over to the right. The grid and each of the runes is illustrated in one of 13 colours. These colours denote a loose theme or purpose and can help to identify how the card will fit into a reading. The grid and each of the runes has a value, the grid is worth 16, and the runes: 8, 4, 2 and 1. The colours can vary within each card so adding the values of the same colours can give you a guide as to the importance of that card in that area. It is a bit like adding the value and suit of the playing cards in the Lenormand decks. Now if you are thinking that this is all a bit complex, don’t let it put you off. These features are bonuses and not compulsory to do a reading. However they do offer an extra tool worth exploring. You are encouraged at all times to follow your own feelings when using the deck, but there is a wealth of information and guidance to build your confidence should you need it. There are even instructions on how to tune into the cards, how to shuffle and pick cards, and of course how to do a reading, and a multitude of spreads. I have found my base deck a delight to read with, and have been doing a card a day too. I am looking forward to expanding my deck, not through need, but pure pleasure.